U.S. 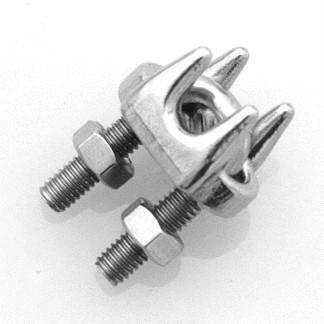 TYPE WIRE ROPE CLIP (4MM) 1/8"
U.S. TYPE WIRE ROPE CLIP (5MM) 3/16"
U.S. TYPE WIRE ROPE CLIP (6-7MM) 1/4"
U.S. TYPE WIRE ROPE CLIP (8MM) 5/16"
U.S. TYPE WIRE ROPE CLIP(9-10MM) 3/8"
U.S. TYPE WIRE ROPE CLIP (12-13MM) 1/2"